SAN GIMIGNANO, ITALY: Northwest of Siena, on the hills of Val d’Elsa, stands the medieval town of San Gimignano, also defined as the town “with a hundred towers”. Like many other towns in Tuscany, the historical town of San Gimignano is a walled city surrounded by breathtaking vineyards and olive groves. Its impressive architecture symbolizes power and wealth of locals from few centuries ago. Out of the original 72 towers, 14 of them are still standing today. The artistic and cultural treasures that San Gimignano possesses today derived from the Middle Ages, when trading developed and pilgrims crossed by this town on their way to Rome. After visiting few other towns of Tuscany, San Gimignano became my most favorite town in this region, even more than Siena. 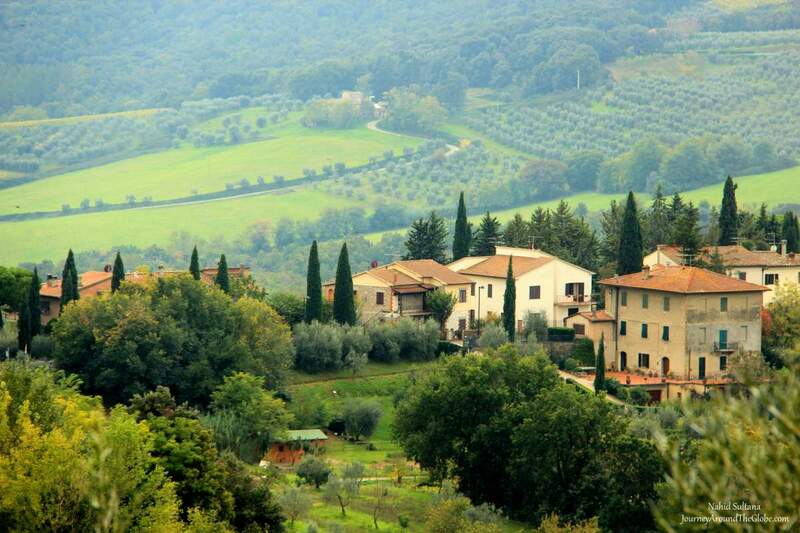 Its small and dark alleys and medieval charm along with rich cultural background make this a gem of Tuscany. Best part was that the historic city center was not overloaded with tourists and lurkers. 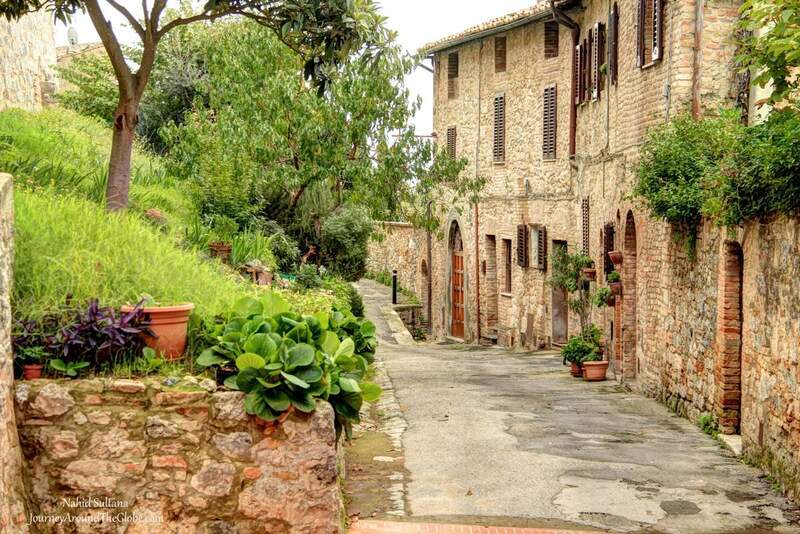 This hill city in Tuscany makes a great day-trip venue from nearby cities, like Siena or Florence. Additionally, it is small enough to enjoy leisurely even on a tight schedule. 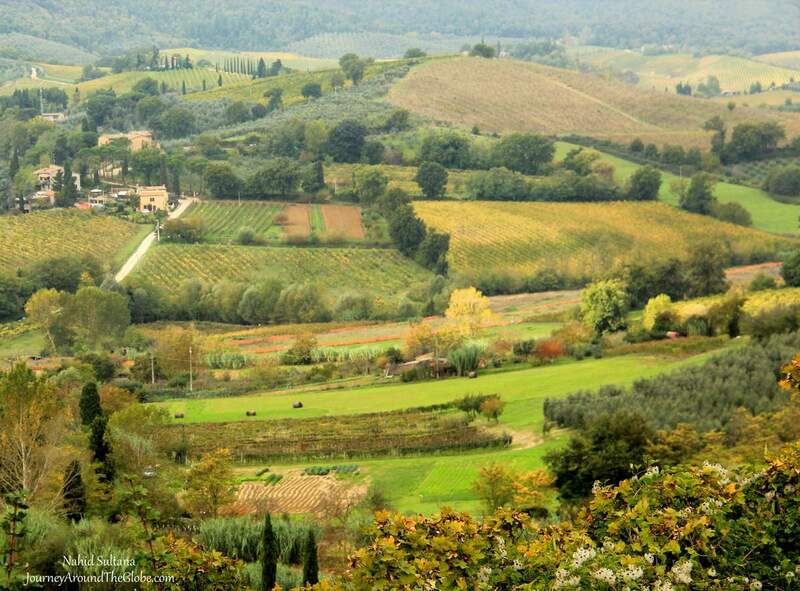 TIME of TRAVEL: Our second trip to Tuscany was in October of 2013. That’s when we had the chance to really explore and appreciate Tuscany. Other than San Gimignano, we were blessed to visit other towns like Siena, Florence, Volterra in Italy and drove all the way up to San Marino. Weather was fantastic with some signs of autumn. Tuscany looked at its best with little bit of vibrant falls colors here and there. OUR HOTEL: We stayed in “My One Hotel in Radda” for the whole time in Tuscany. It’s located in the hills of Chianti…a place which is not only famous for its wine, but also for its art, history, natural beauty, and simplicity. This was a 4 or 5 star resort. We had free grand breakfast buffet, spacious room, clean linens, and excellent customer service. But above all of those, the best part of it is the view from our balcony or from the hotel terrace. Standing on the upper terrace one early morning, I got the perfect glimpse of Tuscan hills and trees hugging the autumn clouds…it was a breathtaking feeling. I felt like I didn’t need to get out, I could have just sit in my hotel balcony all day and enjoy Tuscany right from there. San Gimignano was little more than an hour drive from our hotel but the drive was well worth it. EATING and SHOPPING: After spending couple hours in the beautiful Old Town of San Gimignano, we had to sit down and enjoy some Tuscan food. And what other piazza would be better other than Piazza della Cisterna. We sat outdoor under a big umbrella of a restaurant, called Bar La Cisterna. They have panini, pizza, pasta, variety of soups and salads, gelato, and other sweet treats to choose from. We had some Tuscan bean soup and some breads with porcini mushrooms on top. 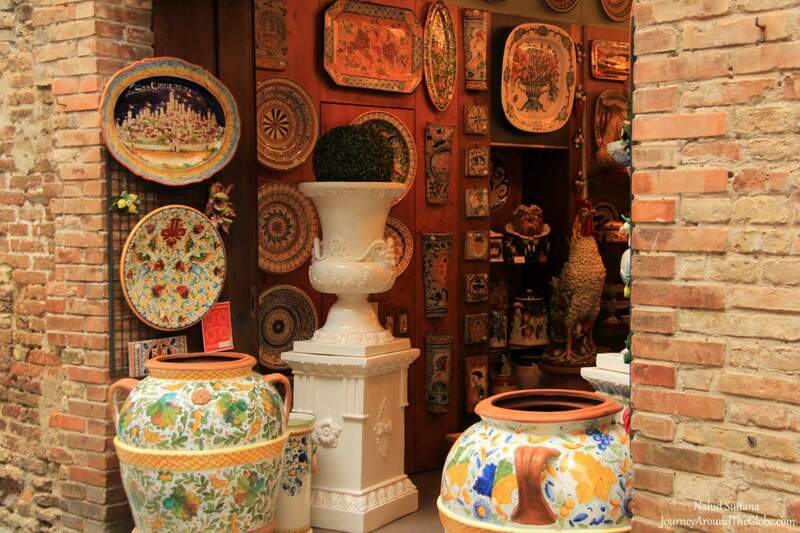 San Gimignano ceramics, potteries, and local handcrafts are particularly beautiful souvenirs for tourists. Their vibrant colors and artistic designs will attract anyone. Paintings by local artists are also very popular here…you can get typical Tuscan landscapes, vineyards, traditional houses, and many more in the galleries of Old Town. Packet food, such as different colors and shapes of pasta, olives, olive oil, spices, and cheese are well known too. But I would suggest to get authentic gourmet olive oils directly from olive presses from the countryside, out of touristic zones. 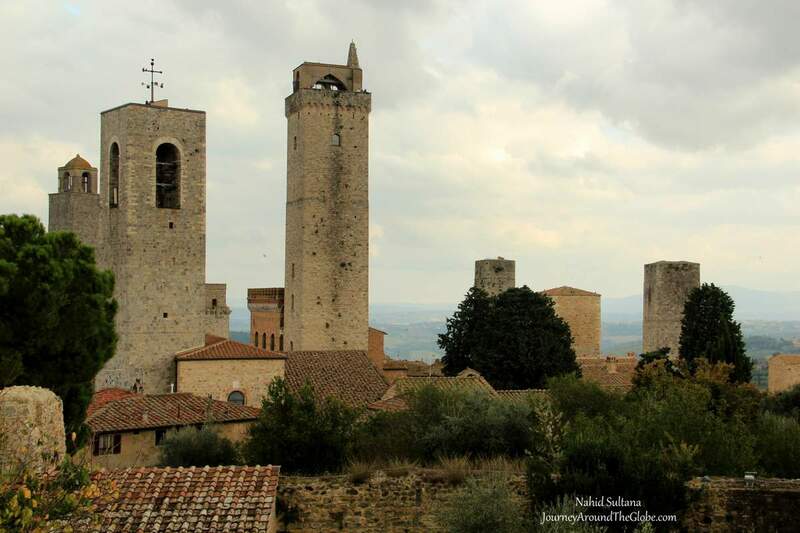 PLACES WE’VE VISITED: We were in San Gimignano only for few hours before heading towards Volterra, another medieval town close by. 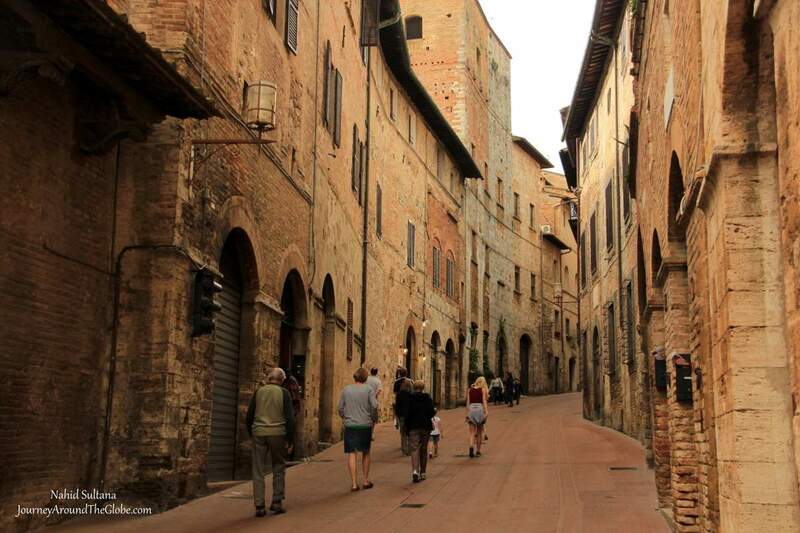 San Gimignano’s Old Town is very small and can easily be covered on foot. But you must leave your car outside the city walls. The local Tuscans are very friendly and helpful here, so don’t hesitate to ask for help if you have any questions about anything. If you can spare some extra time, try visiting one of the original medieval towers here. Torre Grossa is the tallest one from the 13th century at about 200 feet and it allows visitors to go inside for tours. We didn’t go inside, therefore can’t say how the interior looks; but should be an impressive architecture to visit. 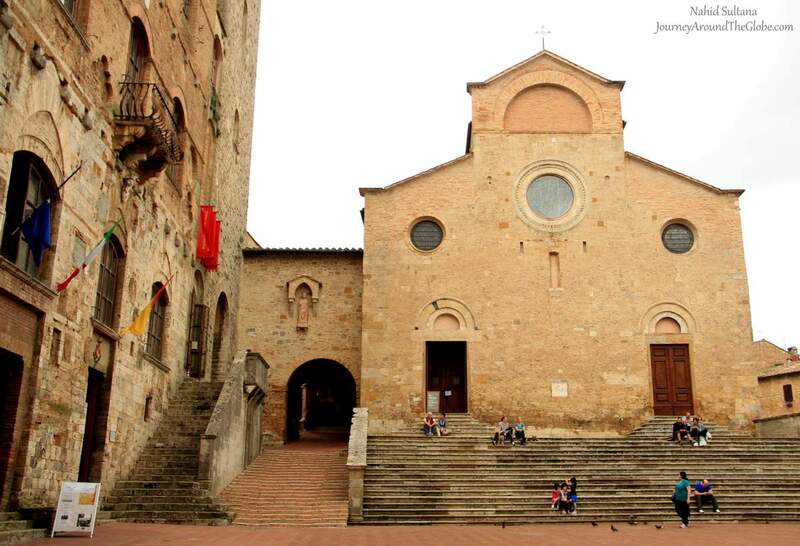 1) CHIESI de SAN FRANCESCO: This place kind up showed up when we entered and started walking towards the center. There is no church here at this moment. It’s now a gourmet shop to buy local souvenirs. Only the outside wall still stands. Historically, this church was originally dedicated to St. John and belonged to the order of the Knights of Jerusalem. It dates back to the beginning of the 13th century, but the only part of the original building still standing today is the lower section of the façade which is marked by five bowed arches set on semi-columns. The various decorative patterns of the Romanesque façade are evidence of the influence of Pisa and Lucca. 2) PUNTO PANORAMICO: We were following a sign for “Punto Panoramico” and ended up on this spot which gives you some exceptional views of the countryside, vineyards, old houses, and distant mountains. Standing there was absolutely breathtaking and gave us the chance to get some stunning glimpses of Tuscany. 3) THE COLLEGIATA or DUOMO: San Gimignano Duomo, also known as Collegiata di Santa Maria Assunta, is located in Piazza del Duomo. Piazza del Duomo is the town church square surrounded by many thousand-year-old towers and another piazza that I fell in love with instantly. This piazza also house the Pinacoteca Civica, which we didn’t cover, is an art and painting gallery. The Duomo is a must-see here. This is a parish church of San Gimignano from 1148. The interior consists of three naves divided by columns with capitals sculpted by local workers. Its splendid series of Biblical frescoes on Old and New Testaments are beautiful to look at. Although the church is not that big, it contains some pretty ceilings and artistic objects. It is 4 euros to enter the Duomo and 6 euros if you add Holy Art Museum. We weren’t allowed to take any pictures inside the church. 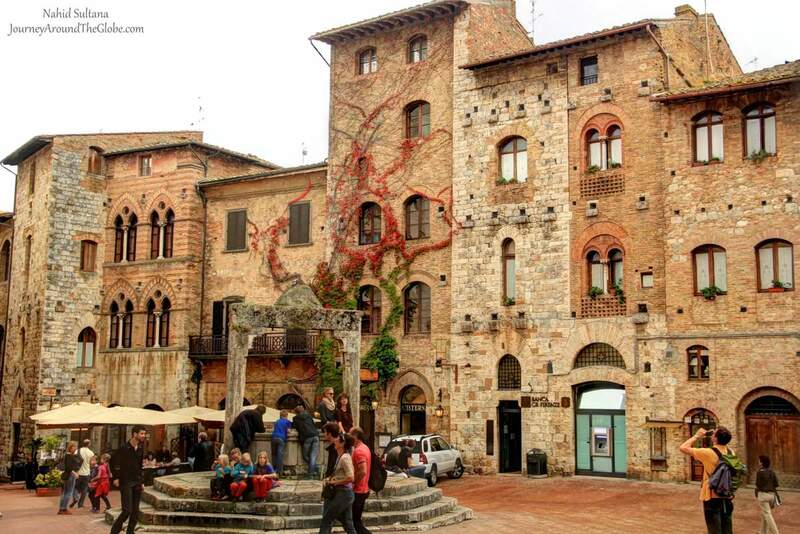 4) PIAZZA della CISTERNA: Connected with Piazza del Duomo with a narrow pavement, Piazza dell Cisterna is probably the most beautiful square of San Gimignano. It is bordered with nobility houses and centuries old stone buildings with an old well in the middle. 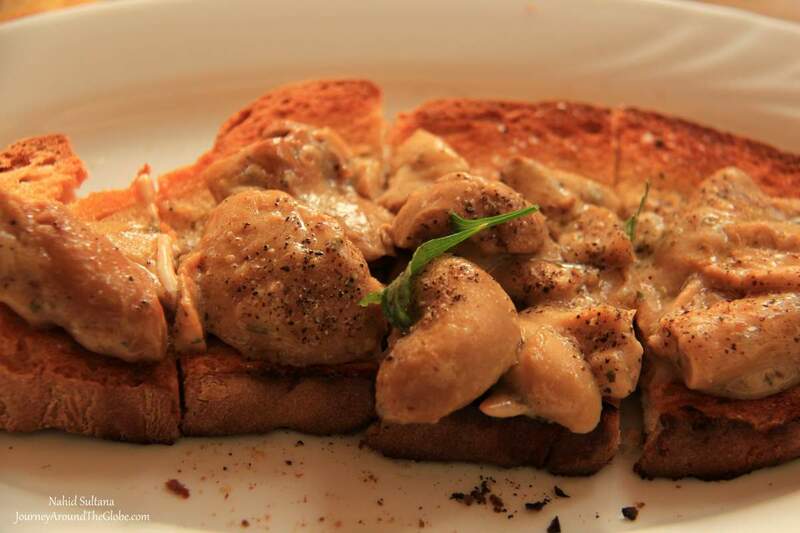 You can find plenty of gourmet eateries here, one of the best places to enjoy a meal or drink in the old part. Originally, this was a marketplace with local performances and cultural activities. Currently, this is a gathering place with plenty of gourmet eateries and shops. 5) ROCCA: Rocca is a site where an old fortress used to be if I am not mistaking. We didn’t see any sign of fortress there really other than some ruins of walls, but it is a nice spot on the hill to get a beautiful panoramic view of the countryside. 6) PORTA SAN GIOVANNI: This is one of the old town gates from the 13th We didn’t really see much here, except some old ruins buried on the open ground. You do get a nice view of the hillside from a corner.